Happy New Year from all of us at the International Storytelling Center! Whether your 2017 was a time of great shifts or relative calm, we are so excited to step into the next chapter alongside you. As you might have noticed, we here at the ISC are kind of obsessed with storytelling. And the turning over of the year is one of the greatest opportunities we have to reflect on the stories we’ve been telling ourselves and look ahead to what’s to come. New Year’s Eve traditions all over the world offer meaningful ritual to help us step fully into what’s next. It’s been a few days since 2018 actually started, but we wanted to trace five New Year’s Eve and New Year’s Day traditions, which you may or may not already know about, as a way to delve into the stories we create for this time of the year. If you’re ringing in the new in Spain, you’ll be having a little something to eat with your glass of cava, or sparkling wine. “Las doce uvas de la suerte” (“the twelve grapes of luck”) is a tradition that Spaniards, as well as people in some Latin American countries, would be loath to miss. At the stroke of midnight, revelers eat 12 grapes—one at each bell stroke—to ensure that the year ahead will bring health, wealth, and happiness. The tradition supposedly started in 1895 in Madrid’s famous Puerta del Sol plaza. By 1909, it was firmly established by a group of Alicantese viniculturists who had extra grapes to sell after a particularly bountiful harvest. ¡Salud! If you spend New Year’s Eve in the Bahamas, you’ll likely witness a Junkanoo (pictured above), in which performers dressed in brightly-hued, handcrafted costumes take to the streets to dance, act, and play music. The Junkanoo tradition dates back to the time of slavery in the Caribbean. The period between Christmas and New Year’s was often the only holiday for enslaved peoples, and it was during the Junkanoo that many cultural traditions from African and Creole societies could be celebrated. 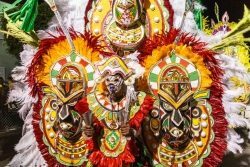 The origin of the name “Junkanoo” is a mystery, but this carnivalesque revelry has been a beloved cornerstone of Caribbean identity for centuries. Want to go? Nassau’s Junkanoo is said to be the biggest and best. Beginning just before the stroke of midnight, Japanese temples ring their bells 108 times to dispel sins from the previous year and set an intention for the coming one. 107 bells peal out in the old year and a single bell becomes, for many, the first sound of a fresh start. This tradition, called “joya no kane” (“New Year’s Eve night”) is thought to combat the desires and passions of humans (bonnou), which are believed to cause suffering. While some temples allow visitors to ring the bell, most bells are rung by monks. Siberia on New Year’s Eve must be a cold place indeed. But local celebrants aren’t deterred by subzero temperatures. Far from it! The Siberian New Year’s Tree, or “yolka,” tradition combines elements of a polar plunge with folklore as divers take a dip in nearby lakes and rivers carrying tree trunks, an activity that symbolizes fresh beginnings and honors the coming of the spirit of Father Frost. While some tales characterize Father Frost as a child-napper, others spin stories of the spirit as a giver of gifts, kind of like Santa. Temperatures for these frosty planting days can get as cold as -50 Fahrenheit. Hot chocolate, anyone? This New Year’s Day culinary tradition is particularly popular in the American South. Eating black eyed peas for luck dates back to around 500 C.E., when they were served with meals during the Jewish New Year celebration of Rosh Hashanah. But the combination of peas and rice, which is often the way Southerners serve the legumes, comes out of African-American foodways. Besides bringing luck, the peas represent coins, and when paired with golden cornbread and long-simmered greens, you’ve got a whole plate full of money in front of you. We want to ask: What’s your favorite New Year’s tradition? How does it help you create your story for 2018? Stories in Motion is a regular feature in which ISC examines the fresh ways we see the power of storytelling at work in our world.